What's a cluster that comes to a point three times? A triangle. A trinity. An Arkansas group which in this case is 1"x 3-1/2"x 3-1/2" featuring selective white titanium frosting and a sparkling plate bottom. 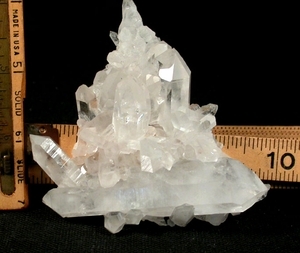 Doubly-terminated and self-healed crystals to 3-1/4"; rainbows; lots of penetrator points; uncommon 7h faced crystals; tabular crystals and twins - you'll see how clear when you hold it to relay your wishes to the universe. No damage.